On a brief trip to San Francisco for New Years Eve, I confirmed the reports that "sea lion packed Pier 39" was unusually empty! 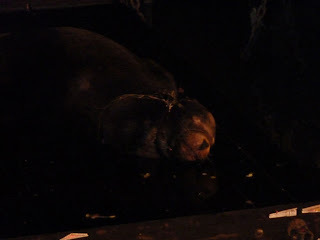 However, on the evening of January 1st, one large male sea lion remained at the dock - suffering. He was suffocating - strangled with fishing line (or plastic wire of some sort) around his neck and snout. A group of tourists watched as the sea lion fought for every breath, and news reporters and their cameras publicized the general concern of the assembled crowd. A passionate few phoned the Marine Mammal Center to alert them of a needed rescue, but subsequently criticized Erin Brodie, the centers on-duty representative, for deciding not to launch a rescue until morning (because of animal and human safety). On the first night of the new year, when hundreds of resident sea lions had departed Pier 39 - one injured remained on the dock nearest to the pier - sending a message. The message is not one criticizing the plans of dedicated rescuers - the message is one of education regarding trash and plastics in the oceans (and other human impacts on wildlife). While I was upbeat at the outpouring of support for the suffering animal, I was disheartened to see many of the onlookers throw their cigarette butts directly onto the pier - and then counting the amount of waste and plastic in the gutters near the pier on my walk back to the hotel. We may not be able to save that brave sea lion (who jumped off the dock and swam away around 7am the next morning) - but we can look to ourselves, shoulder the blame for our gulpable life, and prevent future wildlife/ecosystem impacts. My appreciation goes to all those involved that evening (even those with crazy ideas) - maybe this will propel us to educate ourselves a little more and act; main appreciation goes to Erin Brodie of the Marine Mammal Center for turning a tense situation into an educational one - not to mention her every day, on-the-ground work.